A leaked screenshots suggests that the upcoming Assassin's Creed: Empire will be set in ancient Egypt. Another year, another Assassin's Creed. This time it's Assassin's Creed: Empire, and Ubisoft have dropped precious little information. 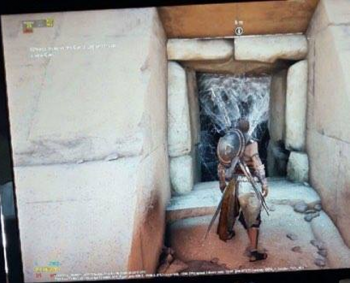 However, a leaked screenshot, courtesy of an anonymous reddit user has seemingly confirmed the setting for the game as ancient Egypt. The image, which you can see to the right, shows our titular assassin clad in some ancient Egyptian garb, about to enter what appears to be a pyramid, or some other sort of stone structure. He bears the assassin's insignia on his shield. The code at the bottom of the image reads "GIZA", and the small image above the "5m" distance tracker looks quite a bit like a sarcophagus. Rumors are suggesting that this new Assassin's Creed will be a "soft reboot" of the franchise, and will take things back to basics. 2016 was the first year in a long time that Ubisoft did not release a new Assassin's Creed title, citing the need "to push the series' boundaries forward and create the best possible game."